Tony Montana manages to leave Cuba during the Mariel exodus of 1980. He finds himself in a Florida refugee camp but his friend Manny has a way out for them: undertake a contract killing and arrangements will be made to get a green card. He's soon working for drug dealer Frank Lopez and shows his mettle when a deal with Colombian drug dealers goes bad. He also brings a new level of violence to Miami. Tony is protective of his younger sister but his mother knows what he does for a living and disowns him. Tony is impatient and wants it all however, including Frank's empire and his mistress Elvira Hancock. Once at the top however, Tony's outrageous actions make him a target and everything comes crumbling down. 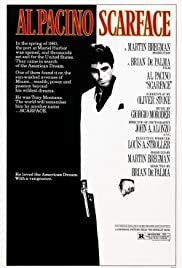 Ya know when one looks at this Brian DePalma film today, I'm sure there has been allot of criticism about how dated it is. Also, about the violence. When I looked at this film on VHS when I was 20, I thought it was ulta-violent and gritty as well. But I didn't get 'it'.